The 2.4 GHz radio system is bidirectional. That means that the transmitter not only sends commands to the locomotive but it also gets feedback data from the receiver in the locomotive. The IEEE 802.15.4 2.4GHz DSSS(Direct Sequence Spread Spectrum) radio transmission provides immunity from other radio sources that are in the same frequency range. Power can come from on-board batteries or track power. The receiver can supply 5 amps of power while accommodating peak loads that can go to 8 amps. Six auxiliary outputs on the receiver can be used to operate sounds, smoke units or lighting. Built in generic diesel or steam sound. 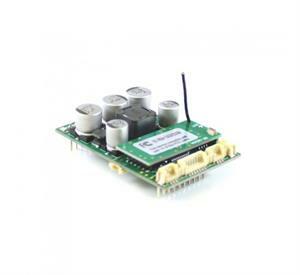 Requirement of input power: 12-24V pure DC. Wirelessly sound and firmware upgradeable. Output voltage is linear so it works well on all maker model trains. Constant voltage is maintained even with output load fluctuation. Works well with non-Aristo locomotives.